This is a scrap of my favorite Basic Grey Romani line of paper from more than 10 years ago. My stash is down to one half sheet. SIGH. And Basic Grey went out of business. 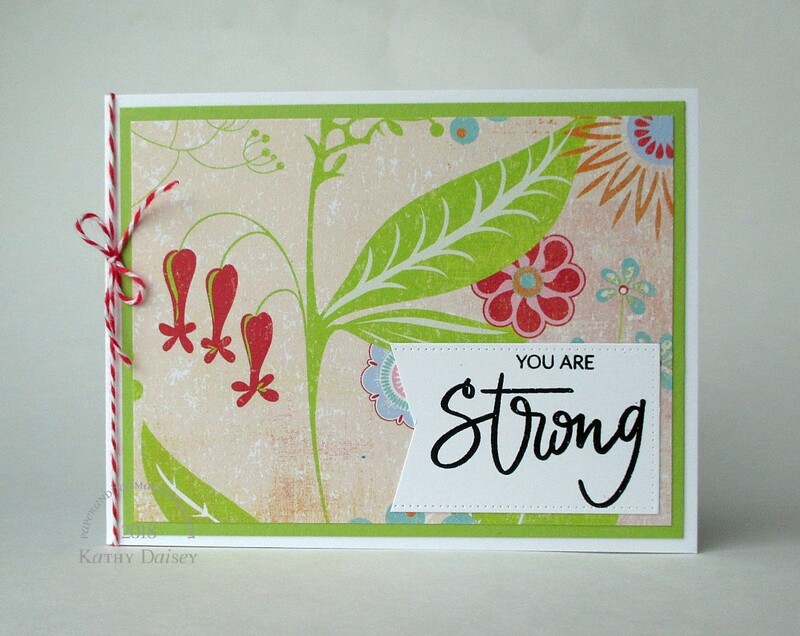 I paired the delicate floral with “You are strong”, and I am sending it off to someone who could use a reminder of just that. Supplies: Stamp – Essentials by Ellen, paper – Basic Grey Romani, Neenah Classic Crest Solar White, Poptone Sour Apple, ink – VersaFine Onyx Black, die – My Favorite Things, embossing powder – Filigree Fine Art Powder clear, twine – MarkerPop. Categories: card, caring, encouragement | Tags: Basic Grey, card, Essentials by Ellen, MarkerPOP, My Favorite Things, Neenah, Poptone, Tsukineko, VersaFine | Permalink. This scrap of paper is from a long time ago! Maybe 2005? 2007? I still love it. Great for kiddos. I think this would make a great get well card (for when “get well” isn’t quite right). Supplies: Stamp – Stampin’ Up!, paper – Basic Grey Giggles, Neenah Classic Crest Solar White, Stampin’ Up! Green Galore (retired), ink – VersaFine Onyx Black, embossing powder – Filigree Fine Art Powder clear. Categories: card, caring, encouragement, thinking of you | Tags: Basic Grey, card, Neenah, Simon Says Stamp, Stampin' Up!, Tsukineko | Permalink. I am very happy I was able to help! Supplies: Stamps – A Muse Artstamps, Essentials by Ellen, My Favorite Things, Simon Says Stamp, Stampin’ Up!, paper – Americian Crafts, Avery Elle, Basic Grey, Carta Bella, Doodlebug Design, Echo Park, Gmund Royal, Heidi Swapp, Home Depot (paint chip), Neenah Classic Crest Solar White, Papertrey Ink Vintage Cream, Poptone Sour Apple, Stampin’ Up! 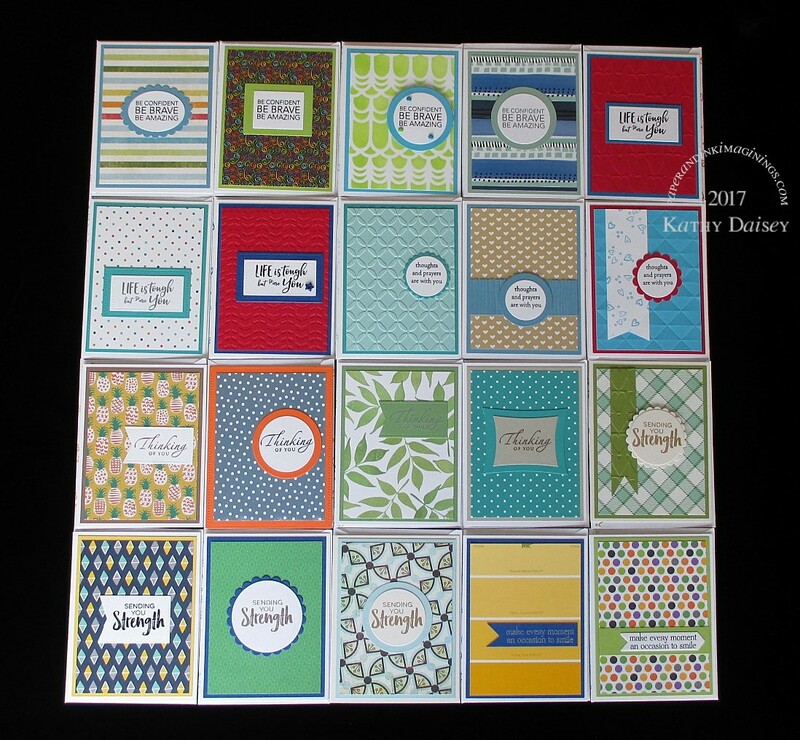 Bermuda Bay, Close to Cocoa (retired), Daffodil Delight, Marina Mist, Night of Navy, Old Olive, Pacific Point, Pool Party, Real Red, Sage Shadow (retired), Sahara Sand, Tangerine Tango, Tempting Turquoise, dies – Lawn Fawn, My Favorite Things, Papertrey Ink, Spellbinders, embossing folders – Provo Craft, stencil – Neat and Tangled, brads & eyelets – Stampin’ Up! (retired), embossing powders – Filigree Fine Art Powder clear, Ranger Silver Pearl, Stampin’ Up! Classy Copper, ribbon – Ellen Hutson. Categories: card, encouragement | Tags: A Muse Artstamps, American Crafts, Amy Tangerine, Avery Elle, Basic Grey, Carta Bella, Doodlebug Design Inc, Essentials by Ellen, Heidi Swapp, Lawn Fawn, My Favorite Things, Neenah, On A Whim, Papertrey Ink, Provo Craft, Ranger, Spellbinders, Stampin' Up!, Tsukineko, VersaFine | Permalink. I mentioned earlier this summer, that one of the teachers from our elementary school was undergoing chemotherapy for an early stage of breast cancer (with an excellent prognosis). My friend had such overwhelming support around her, she decided to channel some of that support into helping other people going through chemotherapy. She asked for donations to create “chemo care bags”, that will be presented to patients who are in the chemo treatment chairs. Think of it as a small makeup bag, containing things you might need while you are hooked up to an IV – tissues, lip balm, hand lotion, hard candy. Fast forward a few weeks, the donations totaled 52 bags! I got a message asking if I could donate some encouragement cards (one per bag). So, I am gladly donating half of the cards she needs. We decided on flat panel cards (no fold, blank on the back). My biggest challenge – they all have to be gender neutral (because they will be randomly handed out). No flowers! 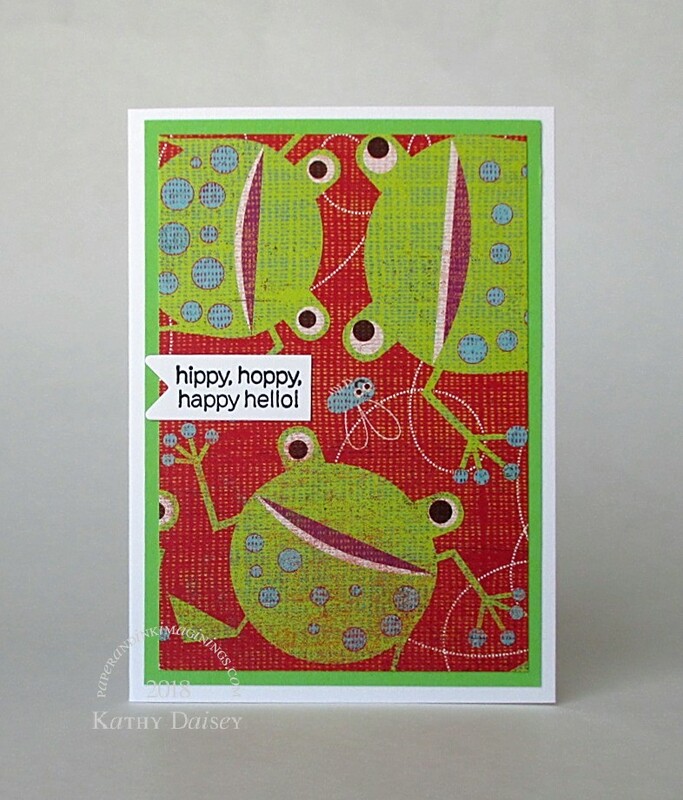 Supplies: Stamp – My Favorite Things, paper – Basic Grey, Papertrey Ink Vintage Cream, Stampin’ Up! Soft Sky, ink – VersaFine Vintage Sepia, dies – Spellbinders, embossing powder – Stampendous Gold Detail powder. 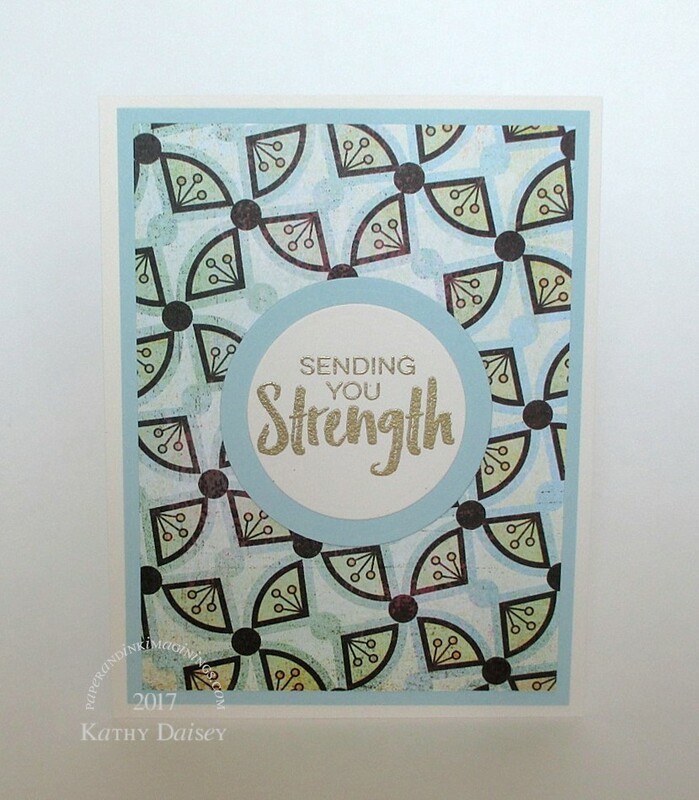 Categories: card, encouragement | Tags: Basic Grey, card, My Favorite Things, Papertrey Ink, Spellbinders, Stampendous, Stampin' Up!, Tsukineko, VersaFine | Permalink. I am still trying to coax my creativity out from under the couch. Working on a project that needs some masculine options. Supplies: Stamps – Stampin’ Up!, paper – Basic Grey, Gmund Royal, Neenah Classic Crest Solar White, Papertrey Ink Vintage Cream, Stampin’ Up! Bashful Blue (retired), ink – VersaFine Onyx Black, die – My Favorite Things (pierced rectangle), embossing folder – Provo Craft, embossing powder – Filigree Fine Art Powder clear, twine – MarkerPOP. 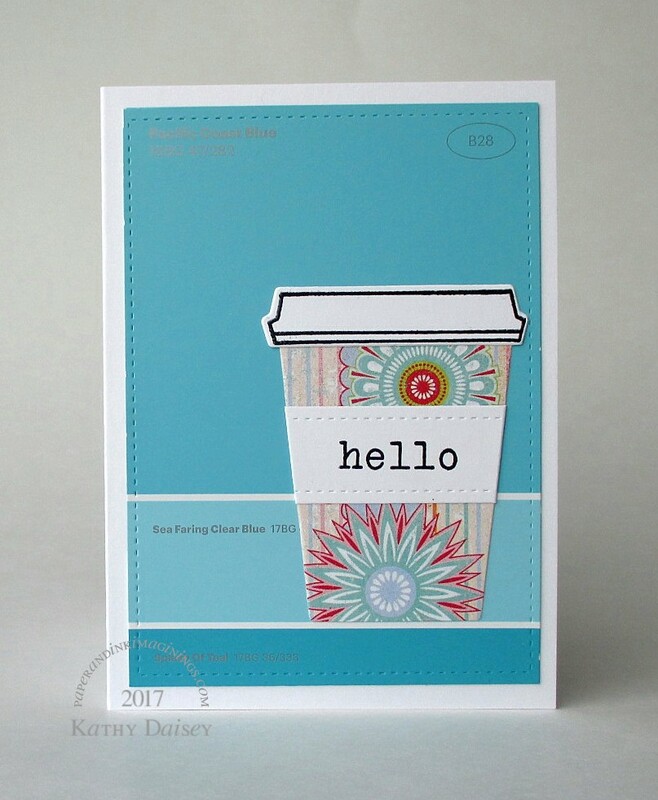 Categories: card, note, thanks, thinking of you | Tags: Basic Grey, card, MarkerPOP, My Favorite Things, Neenah, Papertrey Ink, Provo Craft, Stampin' Up!, Tsukineko, VersaFine | Permalink. Working on a set of notecards (this is the last one). Struggling creatively. I decided on the scrap of Basic Grey for the coffee cup first (an OLD scrap!). Then, the idea of a paint chip in the background smacked me in the head. My paint chips can always pull me through! Supplies: Stamps – Hero Arts, paper – Basic Grey Romani, Home Depot paint chip, Neenah Classic Crest Solar White, ink – VersaFine Onyx Black, dies – Hero Arts (cup, lid), Lawn Fawn (stitched rectangles), embossing powder – Filigree Fine Art Powder clear. 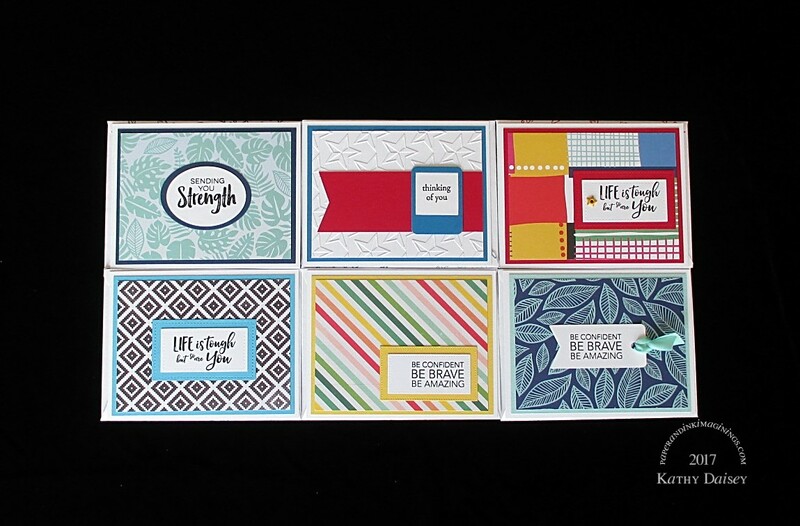 Categories: card, caring, encouragement, thinking of you | Tags: Basic Grey, card, Hero Arts, Lawn Fawn, Neenah, paint chip, Tsukineko, VersaFine | Permalink.